Did You Know Proactive Chat Leads to More Engagement? Nothing beats a successful interaction with your patrons. You work hard to make the library an inviting, comfortable, and useful space so that you can be of service and build a relationship that encourages people to return again and again. If someone were in your library, it's likely that you'd be the first to say hello. Today, more and more people are visiting you online. While they can navigate around your website and get a good amount of work done on their own, it's still a great idea to say hello. Sometimes users need to be asked if they need help. This is difficult with online users because in-person cues cannot be used to engage when the users need assistance. Proactive chat widgets help to solve this problem as the chat box slides out onto the screen and prompts the user for help. LibAnswers with LibChat offers the option of enabling Proactive Chat. When you're using the button pop-out or slide-out tab chat widget, you can set it so the action of the pop/slide can be triggered after any amount of time you designate. Lets visitors know you're online and available to answer questions. Think of it as your virtual Hello. Is dismissible by the patron and will remain dormant for 5 minutes, appearing again if/when the page is refreshed. Promotes your LibChat service. Even if they don't use it at that moment, they now know it's something you offer. A simple Do you need help? can boost the usage of your chat service and support the rise in reference questions that come into the library. From implementing the proactive chat widget in the library's online resources, incoming answered chat questions have doubled overall from 4,020 questions answered in 2015-2016 to 8,120 questions answered in 2016-2017. For some months, the incoming chats have tripled in numbers. 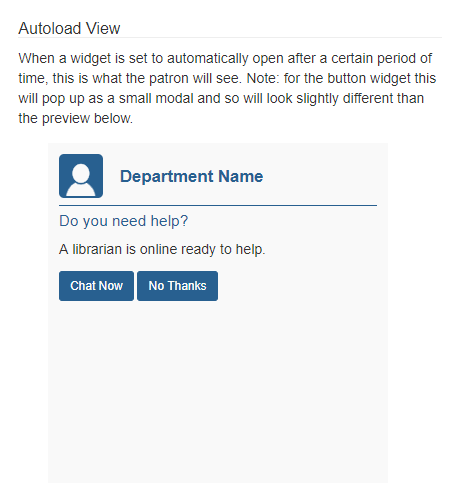 The numbers affirm that having a proactive chat widget on the library's online resources will increase chat usage which means reaching more online users. Before implementing a proactive chat widget, it is recommended to do a pilot test because visibility of the widget can lead to increased usage. It is essential to manage expectations and draft a chat policy that staff can refer to, especially when multiple departments staff chat. A similar policy can be drafted and advertised so users know what to expect when they use the service, such as help and response time on emails.